ANC 6D gave its unanimous support last night to designate Town Center East as a historic landmark. The Waterfront Tower Homeowners' Association, along with the Southwest Neighborhood Assembly, have applied for historic status with the DC Register for the pair of buildings on 3rd Street, designed in the modernist style by I.M. Pei in the 1960s. 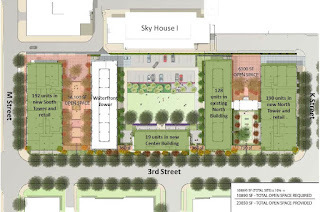 The move to grant landmark status to the buildings, grounds, and parking lots comes at the same time that The Bernstein Companies is trying to get approval for their consolidated PUD application which would replace the surface parking lots with two new high-rise residential buildings with some ground floor retail and a third smaller building in the open space between the existing Pei buildings. At last month's ANC meeting, the commissioners voted not to support the Town Center PUD as-is and asked the developers to rework their plans & meet with the Waterfront Tower residents to hear their concerns. 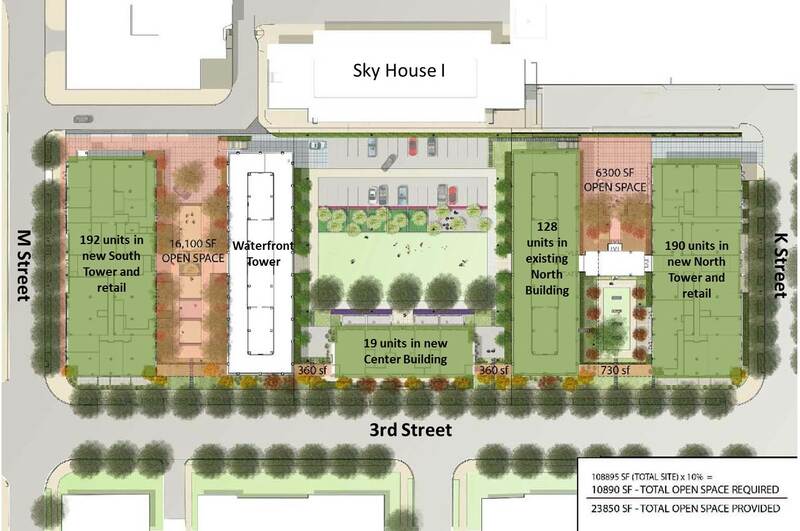 Current plan for new and existing buildings at Town Center East. Historic designation would complicate things, but as Cecille Chen, the head of SWNA's historic preservation task force said at Monday's meeting, the designation of a property as historic wouldn't stop future development, it helps to bring development that is appropriate since the Historic Preservation Board would have a say in any plans to build on the site. If Town Center East is designated historic, it would join other modernist residential complexes that have recently been designated historic, including Tiber Island and Harbour Square. Potomac Place Tower was designated historic almost a decade ago..